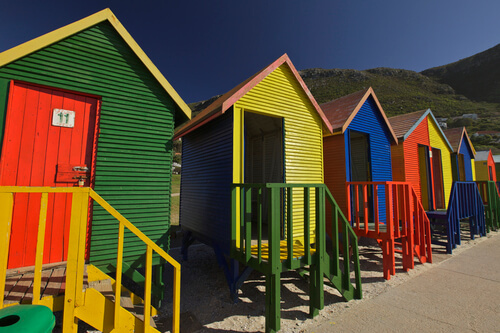 South Africa is an incredibly diverse country – its landscape, people and culture are like nowhere else. Here’s what you need to know before you go on a holiday to South Africa. If there is one word that sums up South Africa, it is diverse. What other country has 11 official languages, ever-changing, dramatic landscapes, and a multicultural population that draws on traditions from all over the world? With an area of 1.22 million square metres, this is a giant land of sweeping savannas, incredible wildlife, soaring mountain ranges, rugged coastlines and bustling mega-cities. For most visitors from Australia and New Zealand travelling on holiday to South Africa, the first glimpse of Africa is from the sky. Gauteng is South Africa’s smallest, but wealthiest province. The region is home to one of two capital cities, Pretoria (the other is Cape Town), Johannesburg and the country’s most well-known township, Soweto – once home to two Noble Peace Prize winners, Nelson Mandela and Desmond Tutu. Flights arrive into OR Tambo International Airport, a major, modern air travel hub, with connecting flights throughout South Africa, Africa and the world. All the standard airport conveniences including duty-free shopping, pharmacies, foreign exchange outlets and ATMs, are available. The South African currency is the Rand – roughly AU$1 is equivalent to R10 and South Africa represents excellent value for money for Australian and New Zealand tourists. From OR Tambo International Airport, visitors can connect on onwards to other cities including Nelspruit, the gateway to the world-famous Kruger National Park; Cape Town, South Africa’s best-loved city or; Durban, KwaZulu-Natal’s beachside playground. Visitors to South Africa are routinely wowed by the country’s dramatic landscapes and the sheer variety of scenery – the country has nine UNESCO World Heritage Sites including four cultural sites. The cities of Johannesburg and Pretoria are located in the Highveld – literally ‘high bush’. Perched on an escarpment 3000 m above sea level, this is a unique geographical feature. Travel about 350 km northeast of Johannesburg towards Nelspruit and the escarpment dramatically drops off, revealing the savannahs, grasslands and forests of the Lowveld in Mpumalanga (place of the rising sun). This is safari country and a visit to the Kruger National Park, where the Big Five (elephant, buffalo, leopard, lion and rhino) are found, is a must. Alternatively, head about 350 km south of Johannesburg to the Drakensberg – a UNESCO listed mountain range that is a favourite with hikers, nature lovers and history buffs keen to discover more about the country’s first inhabitants and their significant rock paintings. In Central South Africa there’s the Free State Province – an important agricultural area – and beyond that, the Karoo of the Northern and Western Cape provinces. A seemingly empty expanse of scrub, the Karoo is, in fact, rich in archaeological finds. Keep going towards the coast in KwaZulu-Natal and the peaks turn into green rolling hills that once witnessed fierce battles between the British military and legendary Zulu army. The Zulu nation remains a proud people and Zulu is the most widely spoken African language in South Africa. The KwaZulu-Natal coast is a tropical paradise complete with white sand beaches and crashing Indian Ocean waves. On the opposite side of the country is South Africa’s other, more famous coastal city: Cape Town. Affectionately known as the Mother City, its most famous landmark is Table Mountain. The Dutch established an outpost here in 1652 to grow fresh fruit and vegetables for the ships of the Dutch East India Company which sailed between Europe and India. Of course, there were people – the ancestors of the San people – here long before that. Sadly, most succumbed to disease or were killed due to colonial violence. 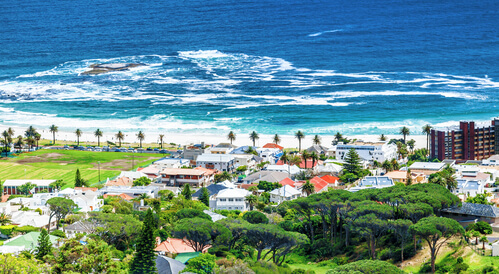 While Cape Town has a fascinating history, it’s the scenery that never disappoints. 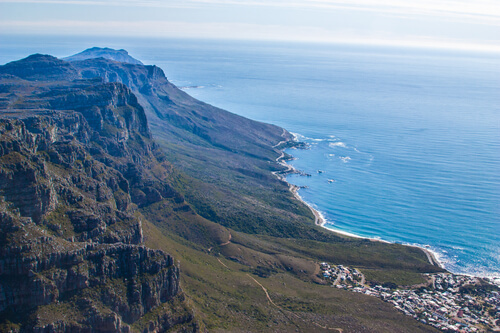 One special spot is Cape Point, where the mighty Atlantic Ocean meets the Indian Ocean. 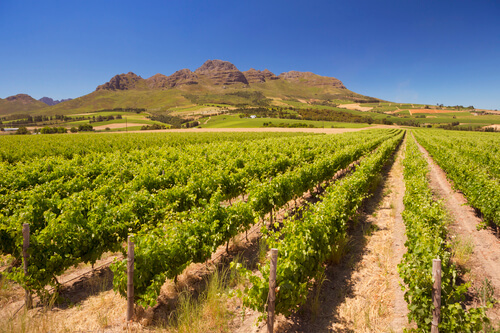 The Western Cape is also blessed with stunning wineries set among the dramatic mountains of Stellenbosch and Franschhoek as well as a young and vibrant nightlife and world-class eateries. Little wonder it’s a popular holiday spot for celebrities and royals alike. While the natural beauty of South Africa is undisputed, it’s the people that make the country truly remarkable. The Rainbow Nation’s favourite son is Nelson Mandela, who became the country’s first democratically elected president in 1994, formally marking the end of apartheid. While the legacy of apartheid lives on in widespread inequality, South Africans are a vibrant, friendly, multi-ethnic and multi-cultural people. This melting pot is evident in the nation’s eclectic mix of flavours and foods. South Africa has 11 official languages including Zulu, Xhosa, Afrikaans and English. The latter is widely spoken so it’s easy for visitors to communicate with locals. South Africa has a modern road and air infrastructure system. World-class highways and modern airports are also served by full-service and low-cost airlines and connect the country’s major cities. Rideshare services like Uber are popular and private taxis can be booked at hotels. 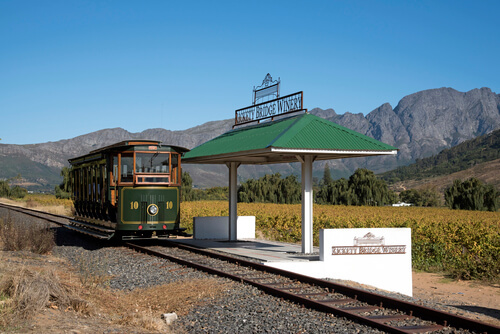 Two luxury train operators – the Rovos Rail and the Blue Train each provide a unique perspective of the country. South Africa has people from a wide range of socio-economic backgrounds and it is no secret that crime is pervasive. Visitors should apply common sense and take precautions. These include locking valuable items, including electronics such as tablets, laptops and phones, in hotel safes. Consider leaving any valuable jewellery at home and be discreet with cameras and other valuables. Never leave valuables or electronics in checked-in baggage on flights and always lock and secure baggage. As always, adequate travel insurance is recommended. South Africa has excellent doctors, dentists, health professionals and networks of private hospitals in urban areas. The private nature of health care means that travel insurance, including adequate medical insurance, is a must. Some parts of South Africa, including parts of Mpumalanga and the Kruger National Park, are malaria areas and the disease is most prevalent in the hot, wet summer months (October–April). Check with your GP about anti-malarial medication and ensure your standard vaccinations are up to date.